Sign says 4×4 only on way to several overlooks of the Canyonlands. Most of the fun on this route is in the last two miles. 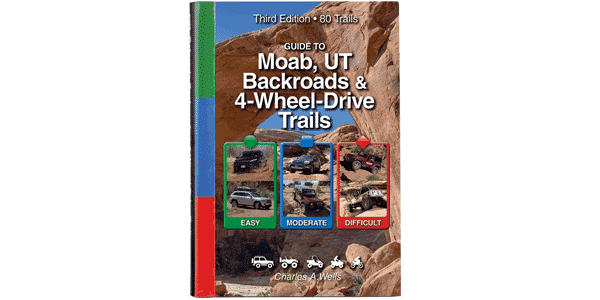 Here you’ll do some actual 4-wheeling on your way to two great overlooks. There are many side roads crisscrossing the area, but the main route is marked or obvious. Unlicensed vehicles are allowed. Please stay on the main route. Take binoculars. First part of route is easy. After 5 miles the terrain gets rocky with some minor climbs and small ledges. Stock, high-clearance, 4x4 SUVs can do it with careful tire placement.